MONKEY BUSINESS: The Ape is the new beast from Tex Perkins. Pictured are Agars, Bourke, Perkins and Sanchez. 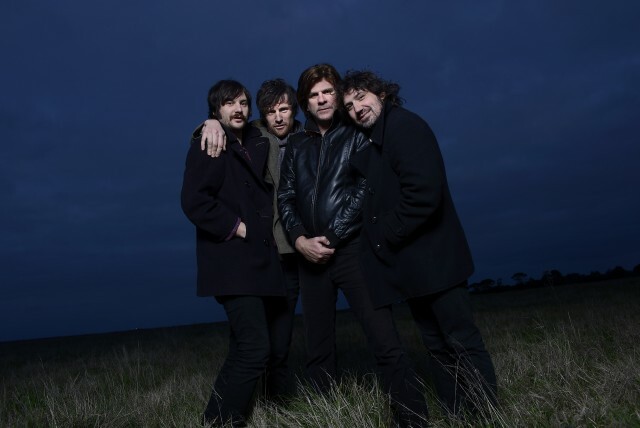 Tex Perkins makes some attention-grabbing remarks in the press release for his new band The Ape’s self-titled record. This is a big statement from an entertainer whose diverse resume includes front man of rowdy rock pigs Beasts of Bourbon and eclectic southern rockers The Cruel Sea, plus one third of Tex, Don and Charlie. It’s also a sensational claim when you consider his acclaimed portrayal of Johnny Cash in the stage show The Man In Black and his film score for the impressive Australian movie Beautiful Kate. The Ape’s debut record is a collection of songs that Perkins has been working on for many years, but were not a musical match for his established projects. But the time came for The Ape to evolve. So he called in friend and former Magic Dirt guitarist Raul Sanchez, drummer Gas Agars – who played in Perkins’ The Dark Horses group – and former Dallas Crane bassist Pat Bourke. The songwriter chose his fellow Ape band members not just on their proven ability in the rock arena, but also on established camaraderie. Perkins reveals that he has a hard drive full of musical ideas like those that led to the creation of The Ape. And his musical experiments are diverse – many of which he hopes will never see the light of day. Fans of Perkins’ rock songwriting won’t have any objections to The Ape. The record is full of big riffs and takes some unexpected turns into more simmering, slow-building numbers. And it translates perfectly to a live setting.